Evan Longoria celebrates with teammates after hitting the game-winning HR (his second of the night) as the Tampa Bay Rays won the American League Wild Card berth. Evan Longoria had a heck of a season for a guy who finished the year with a .244 batting average for the Tampa Bay Rays. The Boston Red Sox may have collapsed, but Longoria was as responsible for carrying his team as any player has been all season. Longoria’s second home run of the game Wednesday night – a walk-off with one out in the 12th inning against the New York Yankees that gave Tampa an 8-7 win and the AL Wild Card berth – was his fourth career walk-off HR and second of this season. Longoria's HR is the sixth game-ending HR in MLB history which clinched a postseason berth, according to the Elias Sports Bureau. • All 31 of his HR hit came with the score tied, or within four runs, one way or the other. • The last 10 home runs he hit during the regular season either tied a game, gave the Rays a lead, extended a lead of one or two runs, or cut a deficit to a run. • Longoria had four home runs in the eighth inning or later that either tied a game or put the Rays ahead. Only two players in MLB had more -- Jose Bautista with six, and Jay Bruce with five. • In the two-week stretch from September 15 to the end of the season, Longoria faced a two-strike situation 32 times. He reached nine times via hit and seven times via walk, giving him a two-strike on-base percentage of .500 (MLB average for the season was .247). He also reached base via error once. • Despite missing 29 games, Longoria entered the final day of the season fifth in the major leagues in Defensive Runs Saved among third basemen with 12. September 15-18 - Longoria was 6-for-15 with two home runs and seven RBI as the Rays won three of four games in Fenway Park from the Red Sox. In the game the Rays lost, Longoria homered, singled, walked twice, and made an amazing catch on a Dustin Pedroia line drive that turned into a double play in the seventh inning, with the Rays down a run. September 27 - With the Rays down 3-2 in the sixth inning against the Yankees, and the bases loaded with nobody out, Longoria starts a 5-4-3 triple play to get the Rays out of a jam. Then, in the seventh inning, facing an 0-2 count, Longoria fouls off three pitches (including two well out of the strike zone) and works out a walk from Rafael Soriano. The next batter, Matt Joyce, hits a home run that propels the Rays to a 5-3 win. 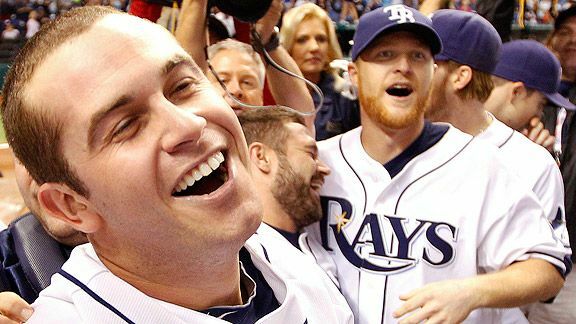 September 28 - Longoria helps the Rays rally from a 7-0 deficit. He hits a three-run home run to cut the lead to 7-6 in the eighth inning. Then, he hits a walk-off home run to win the game and clinch the wild card in the 12th inning.